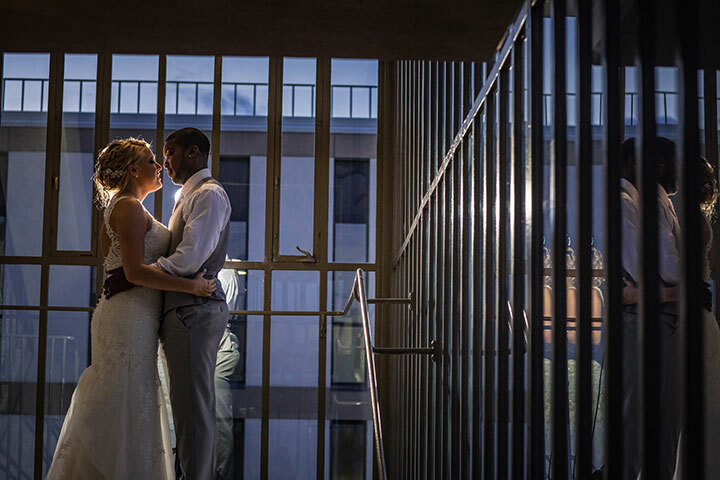 Ashley Christofferson and LaQuan Fenderson’s summer wedding at the Milwaukee War Memorial was one to remember. On Saturday, July 8, with boats drifting by and brilliant blooms in the background, they tied the knot and got ready to party. 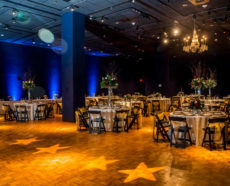 Working closely with our talented Adorn event designers, they were able to add exceptional color and style to an already phenomenal wedding location. Take a look at how Ashley and LaQuan incorporated their radiant personalities into their unforgettable wedding. 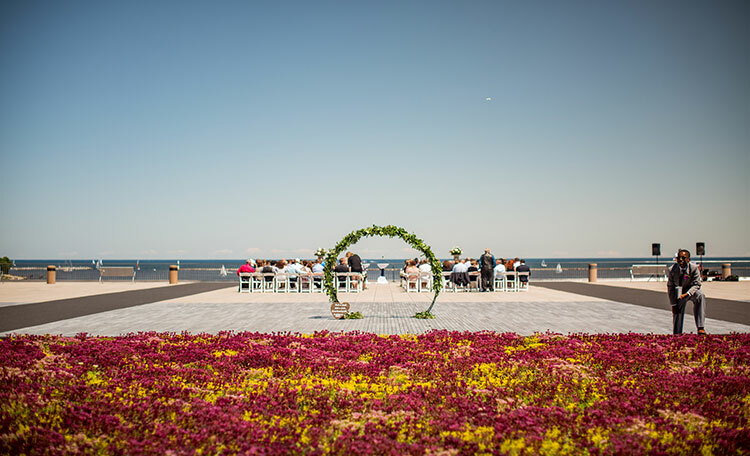 With a stunning flowerbed and vistas of Lake Michigan, it is hard to top the Milwaukee War Memorial’s Fitch Plaza for a waterside ceremony site. At 2pm, Ashley and LaQuan’s 206 guests gathered in this idyllic space for what turned out to be an incredibly moving and memorable ceremony. The tranquil water, colorful flowers and fresh greenery over the oval arch added exceptional serenity to this captivating location. Tenderloin forks roasted tomato and horseradish: Tenderloin with roasted tomatoes, crisp onions and horseradish cream. Asian chicken salad in cucumber cup: Diced chicken, red pepper, green onion and carrots in a ginger sesame vinaigrette. Buffalo chicken tartlet: A flaky phyllo shell tart filled with spicy chicken, bleu cheese & scallions; garnished with a crisp celery slice and buffalo sauce. Bacon wrapped chicken with strawberry merlot glaze: Seared chicken breast seasoned with garlic, thyme and pepper wrapped in bacon; served with a strawberry and merlot reduction. BBQ pork pop: Savory BBQ pork surrounded by jasmine rice, coated in seasoned bread crumbs; served with spicy scallion oil. 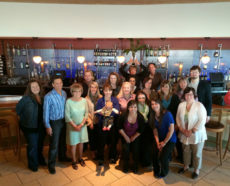 At 4pm, guests took a seat to turn their attention to the introductions and prayer that preceded dinner service. 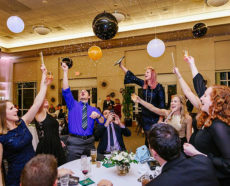 With a champagne toast, six speeches and a slideshow integrated into dinnertime, guests were captivated not only by the flavorful dishes and elegant flower centerpieces but also the memorable words spoken. Chicken bruschetta: Parmesan crusted chicken drizzled with balsamic vinaigrette and finished with a bruschetta topping. Tenderloin filet: Grilled and laced with sauce of choice. Grilled chicken breast: A boneless, skinless breast of chicken grilled and laced with specialty sauces. Guests who opted for the vegetarian main—a scrumptious eggplant napoleon—were not the only ones to notice the fresh ingredients used. Because the other entrees were served with tri-color potatoes and north shore vegetables, everyone got a taste of the great variety of fresh and seasonal ingredients that our chefs find on a regular basis. Having closed for dinner, when the bars opened at 5:30pm, guests were quick to snag another one of their favorite drinks. With the cake cutting ceremony and traditional dances vivid in their memories, they couldn’t wait to hit the dance floor. 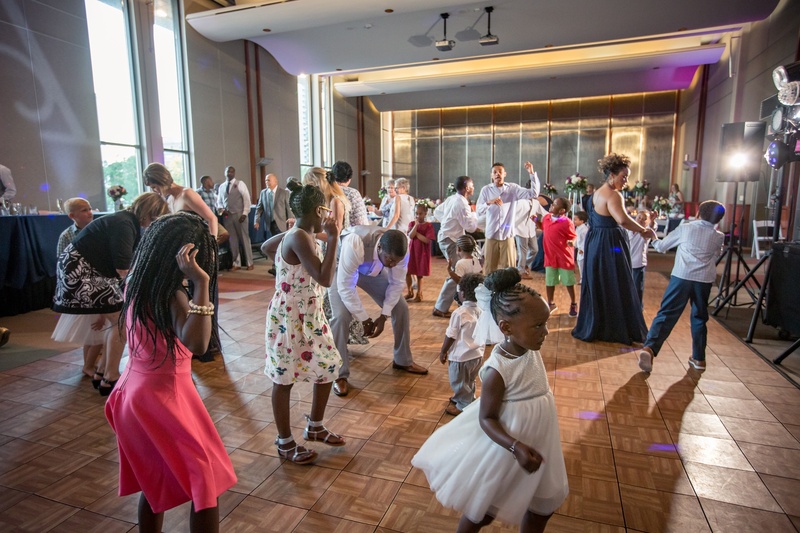 While A Personal Touch DJ kept the energy high, guests of all ages joined in the fun—pausing only to visit the decked out sundae bar that opened at 7:30pm. 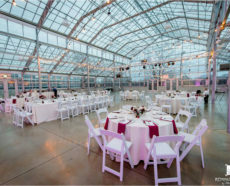 Whether they build a signature sundae topped with real Wisconsin whipping cream and maraschino cherries or simply grabbed a delectable baked good to go with their cup of coffee, all guests were in agreement that the Fendersons’ celebration of love and commitment was worthy of a sparkler lighting ending. And at 10pm, just that happened—capping off an incredible display of style and excitement. If Ashley and LaQuan’s unique vision and beautiful wedding inspire you, then we invite you to grab more creative wedding ideas from this video recap and slideshow. 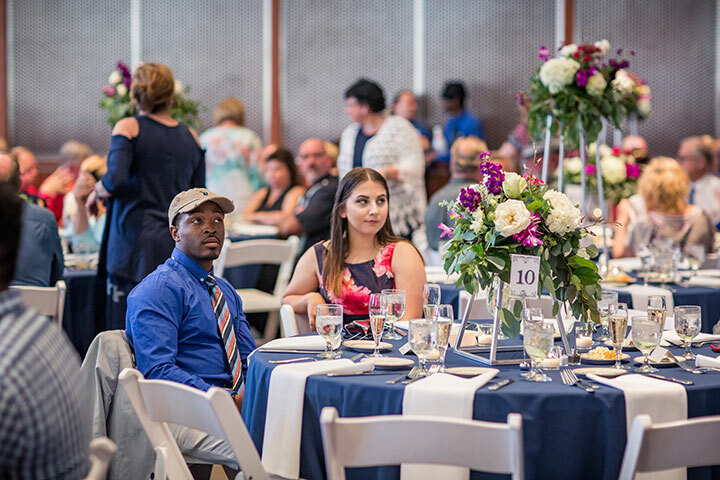 We are thrilled that Peer Canvas was on-site to capture all the precious moments from start to finish, and we can’t wait to see what wonderful times come forth at your Milwaukee wedding. If you would like expert help personalizing your wedding plans and custom menu, contact us on online or on Facetime, or give us a call at 262.547.9447.